A surprise prize will be given to the funniest and it will be featured on our update next month. West Midlands police have "one or two promising leads" on the theft of copper from Bridgnorth, though we are not holding our breath that we will see it again: it seems quite probable that it has been chopped up and is already on its way to the Far East. We will keep you up to date with any further developments, but in the meantime are very pleased to be able to tell you that the SVR's insurers have agreed to meet the cost of the stolen material in full. This is really excellent news, and has given us all heart. On-site security measures have been made still more stringent, both at Bridgnorth and at the Railway's other major sites, and there is a collective determination to tackle decisively the vermin responsible for acts such as this. It's true to say that the long-suffering decent majority of people in this country are heartily sick of the bad behaviour of a minority. Don't forget that the Second AGM of the Trust will be held at 2.00 p.m. on Saturday 2nd April in the upstairs Lecture Theatre at Kidderminster Railway Museum. There will be plenty to talk about, so please try and attend, and by all means bring a friend with you. The Museum has a pleasant little cafe downstairs where you can get tea, coffee and snacks (their toasted sandwiches are worth a try!). Our marketing efforts are soon to be augmented by this attractive new image of a black-liveried 82045 which artist Jonathan Clay has produced for us. As you know, the loco will enter service in BR lined green, but a subsequent repaint has not been ruled out. Swindon originally turned out all 45 members of the class in lined black - those examples working on the WR being repainted into green from 1957 onwards - so the image is an authentic one. To accompany our new Jonathan Clay image we have also commissioned a new colourway for our clothing. The new BR Black logo will be available on the same range of clothing as the BR green and the new badge may be seen on our sales page. 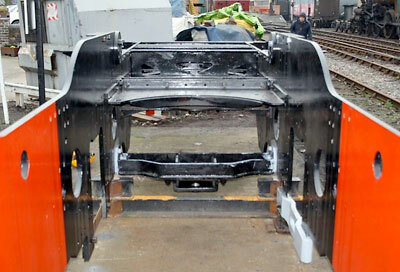 The rear radial arm support stretcher fitted into the chassis. The newly fitted frame keeps. 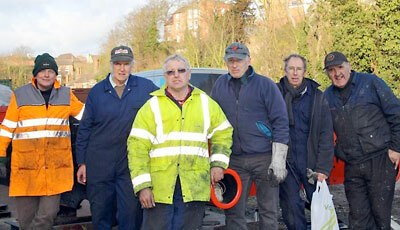 Left to right Chris Proudfoot, Tony Massau, Brian Butterworth, Bryan Clarke, Peter Line and Colin Williams. Photo: Brian Malyon. Richard Fraser boring out the king pin holes on one of the radial arm support stretchers. 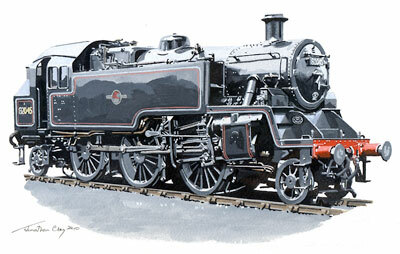 Artist Jonathan Clay's new image of a black-liveried 82045.